"There is a new class of young, rich billionaires in philanthropy," said DLD Co-Chairman Hubert Burda, pointing towards his co-panelists. The digital revolution actually sheds light on "patterns to success", he said. "This new generation of digital entrepreneurs with incredible ideas are changing the way we live and think." One of these new projects is taking place in Downtown Vegas, a non-stereotypical "secret" area of Fremont East. Taking 350 million US Dollars into his hands, Tony Hsieh, CEO of Zappos.com, intends to change the face of the community. Co-learning and collision are the buzz words. His strategy is to turn on short-term ROI (Return On Investment) and rather implement a long-term strategy of ROC (Return on Community). It's all about running into people, random conversations over a coffee and sharing some ideas. This way, one of his clients who got tired of the casino environment opened up a breakfast and lunch restaurant, a live-long dream coming true. 50 million dollars are put into small businesses like these, shaping the future of Downtown Vegas. For him, it's just a great business strategy, not social entrepreneurship or philanthropy as such, Tony Hsieh said. His future vision is that someday "Downtown Vegas will make you smarter." As 50% of humans now live in cities, and within our lifetime it will hit 75%, community-based projects can become places for inspiration. "Philanthropy shouldn't be about giving money," said Naveen Jain, CEO of Inome. "It should be about solving a problem." Only true visionaries can find solutions to big problems concerning society. It needs the mind of an entrepreneur, he said. A social project in these terms should be self-sustainable and scalable. We should never be ashamed of proclaiming that a project actually is profitable. Hubert Burda added that this this protestant attitude ("Tue Gutes, aber bitte rede nicht darüber") of closing one's lips around a project in which you helped others is actually wrong. "The opposite should be the case: You must talk about it!" While the networks grows with the marketing of a project, even with microfunding one can do good. The key is to be relevant as a project in philanthropy, said Peter Thiel, Managing Partner of The Founders Fund. "If you are planning a business like a hundred other people, it's probably not relevant", he said. Peter Thiel gave the advice to dig deeper in order to find socially important projects, those that had slipped the radar of government funding for instance. The education sector in the US is such a major example where there is loads to do. College costs hit the roof, and "education is nearly the opposite of technology." One strategy is to take youngsters out of school and have them working on scientific and technological projects. Despite the better school system, "in Europe, we're much behind innovation," said Hubert Burda. "We don't achieve this combination of business and algorithm." 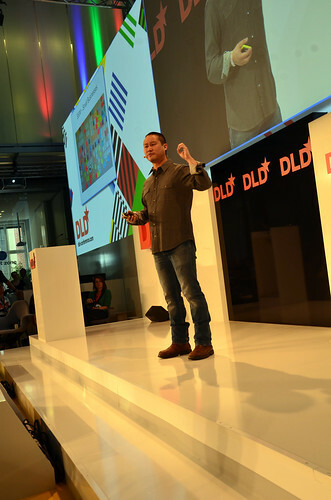 Like at DLD13, we have to look up to role models and learn how to combine the patterns in the future.